IN COLOMBIA,everything grows. All flora seems to flourish in its environment of extremes. Yet the area of deforestation jumped 44 percent in 2016 from the previous year. This was, ironically, due to historic deals with the FARC rebel group. As FARC demobilized, criminal factions moved in to control rainforest areas. And though the country has largely welcomed a hard-won period of peace, the internally displaced population, a result of the decades-long conflict, is higher than Syria’s. Now in its thirteenth year, ArtBo is at once big and small, poised to take on paradox. It serves a city the size of New York, presenting seventy-five galleries, while still keeping a vanguard spirit. Fair programs like Artecámara show national artists who don’t have representation, and a new section highlighted galleries less than six years old. Despite relative stability in the past two years, signs of unrest were visible during the fair—not only because many attendee’s flights were canceled due to an Avianca strike. The Proyectos section, curated by Kiki Mazzuchelli, focused on artists concerned with the rise of global fascism and Colombia’s very recent history. Around town, shows at institutions and galleries echoed this moral stance, seemingly taking cues from the recent São Paulo Bienal by investigating ecological issues (though often without the biennial’s vivid, organic template). “Energ(ética); arte y energía sostenible,” an exhibition put on by Flora ars+natura inside the city’s Monument to the Heroes, examined sustainability, including the carbon footprint of each work, through the elemental themes of earth, water, air, and sun. Despite the show’s simplistic approach, I was impressed by its ambition, both in scale and its sense of responsibility—particularly since the latter doesn’t tend to follow art-fair froth. Left: Artbo director Maria Paz Gaviria. Right: Arist Carlos Motta and MALBA Artistic Director Agustín Pérez Rubio. I visited the Flora space itself on my first day in town, where artist Nicolás Paris was installing his new show. Flora, spearheaded by artistic director José Roca, has been on the vanguard of the regeneration of the San Felipe neighborhood, now considered an arts district by locals. Last year, Roca purchased the building behind the original Flora space, a townhouse in disrepair, cracked almost in half: “It looked like a Gordon Matta-Clark,” he joked. It now holds fourteen studios and a library that doubles as an event space. The expansion has clearly borne fruit, I thought, when I spotted Mauricio Cadena of Mexico City’s Parque chatting with local curator Jennifer Burris in the courtyard. Midweek there was a flurry of early openings at the city’s institutions in advance of the fair’s official start. At Casa Republicana there was a brunch celebrating the opening of “Notebooks of Drawings: Reunions of Graphic Memory,” curated by Beatriz González and Verónica Uribe Hanabergh. Though Mexico City’s MACO fair leads the Spanish-speaking art world, Bogotá is more of a meeting place. With roughly the same flight time to New York, Los Angeles, Buenos Aires, and São Paulo, the fair brought a strong mix of international curators. José Esparza Chong Cuy of MCA Chicago, and formerly Museo Jumex, said it was his first time there; same for Anna Gritz of K-W Institute. Irene Aristizábal, a Bogotá native, came from the UK, where she is head of exhibitions at Nottingham Contemporary. The London-based Mazzucchelli had attended the fair several times, and, as curator of Proyectos, noted that, compared to similar events, “They’re very serious about the content.” At the Claustro San Agustín, this judgment held up. The former eighteenth-century cloister, now part of the Museos de la Universidad Nacional de Colombia, featured two heady exhibitions. “Selva cosmo politica,” a show of fifteen works curated by Maria Belen Saez de Ibarra, presented a concentrated vision of the Amazon as the future of the world. A large-scale installation by Miguel Ángel Rojas took over the building’s courtyard, uniting that sprawling narrative with Carlos Motta’s gem of solo show, “Lágrimas,” in a small gallery upstairs. For his video essay, Motta filmed the museum’s collection of historical objects depicting medical pathologies, such as pre-Columbian artifacts and waxes. 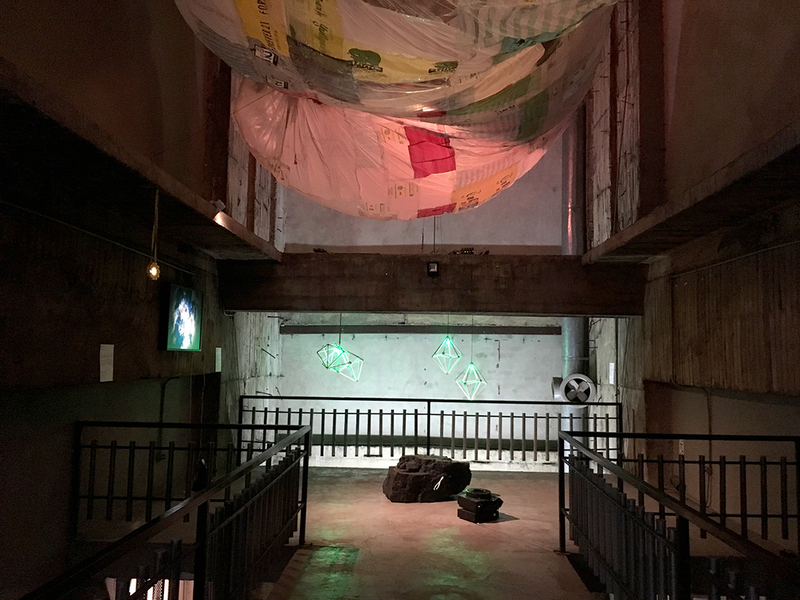 Nearby was a similarly compact, if less subtle, exhibition by Rodrigo Echeverri dealing with the devastation of mining, held inside the Museo de Santa Clara, one of the oldest buildings in the city. Then it was straight to the fair. “I’m a Bogotá virgin,” admitted Alexandre Gabriel of São Paulo’s Fortes D’Aloia & Gabriel, though the gallery itself has participated before, along with many others from Brazil, nearly ten. The fair showcased a wide range of established galleries around Latin America to young upstarts like local newcomer Liberia, from San Felipe. For their Proyectos booth, the excellent Instituto de Vision, also of San Felipe, showed Nohemí Pérez’s work fixating on the country’s displacement crisis. Juana La Loca, a local collector’s clubby restaurant, was packed by 10:30 PM for the kickoff party, bottlenecked at the kitchen and out onto the terrace. I caught up with Danny Baez, whose maverick MECA art fair took place in San Juan, not long before the devastation of hurricanes Maria and Irma. Baez chatted with the Bogotá-born artist Iván Argote, whose work was on view at MAMBO. The two met at last year’s ArtBo on an Avianca flight back to New York, which had to turn around almost two hours into the flight. The two giddily recalled spending the night in the airport. “It’s our anniversary!” Baez yelled. The weekend continued with “No Beginning / No End” at the Museo de la Universidad Nacional de Colombia, also curated by María Belén Sáez de Ibarra, a chapter in a series of exhibitions of Spanish artist Ignasi Aballí, this time accompanied by the work of younger Colombian artists Mateo López and Bernardo Ortiz. And new local players threw events of their own, with parties from the International Dance Biennial of Cali and the Artecamera bash held at San Felipe’s gallery/bar KB.